Tanjant’s Gas Roller Guide improves cutting operations from the first use. The sintered iron wheels spin freely on stainless steel axles and are fitted with a unique hub-guard to ensure free rolling, no jamming. The durable Brass Body is easy to fit, no tools required. Gloves should be worn when handling. Each Roller Guide is profiled to match a specific Gas Torch. Use the Torch Look-Up feature on the Tanjant website to select Torch Brand and Model. The search result will display the correct Part No for the Roller suited to your torch. Another option is the Multi-Fit for nozzles up to 18mm (11/16″) with 12mm (1/2″) parallel section below retainer nut. See more on website. Wheels are height adjustable for correct clearance. Limited bevel cutting an option by setting wheels up and down to tilt guide body. The Gas Roller Guide may also be used with other Tanjant products including TJ6051 Radius Bar and TJ6086 Magnetic Pivot. Tanjant’s Gas Circle Guide improves cutting operations from the first use. The profiled Brass Bushing is factory fitted and tested for smooth turning. Use the offset pin as the pivot point and start with the rail frame under the torch handle, pierce the plate and then rotate the frame to cut around the full circle. See more with How-to-Use feature on website. Each Circle Guide is profiled to match a specific Gas Torch. Use the Torch Look-Up feature on the Tanjant website to select Torch Brand and Model. The search result will display the correct Part No for the Circle Guide suited to your torch. Another option is the Multi-Fit for nozzles up to 18mm (11/16″) and 12mm (1/2″) parallel section below retainer nut. See more on website. The Circle Guide is supplied with offset pivot pin and extension bar to enable circle cutting from 25mm (1″) to 700mm (28″) Actual dimensions may vary with some torch types. The Gas Circle Guide may also be used with other Tanjant products including TJ3085 Bevel Accessory, TJ3585 Stabilizer, TJ6051 Radius Bar and TJ6086 Magnetic Pivot. Tanjant’s Gas Guide Kit improves cutting operations from the first use, for almost any workshop cut requirement. The profiled Brass Bush is factory fitted and tested for smooth turning. Use either the straight or offset pin as the pivot point and start with the rail frame under the torch handle, pierce the plate and then rotate the frame to cut around the full circle. See more with How-to-Use feature on website. 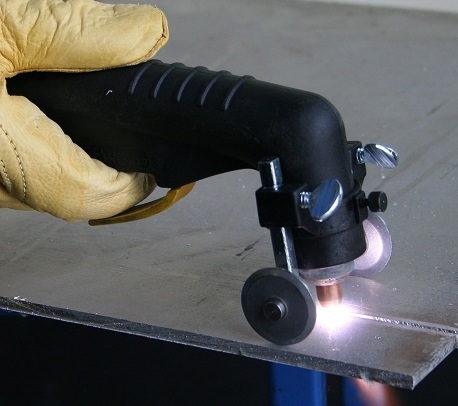 The Bevel attachment enables heavy chamfer weld edge preparation on straight line or arcs. The Kit Manual has detailed drawings on each operation. Each Kit has both Roller and Bush profiled to match a specific Gas Torch. Use the Torch Look-Up feature on the Tanjant website to select Torch Brand and Model. The search result will display the correct Part No for the Guide Kit suited to your torch. Height adjustable to make level cutting platform, stable. 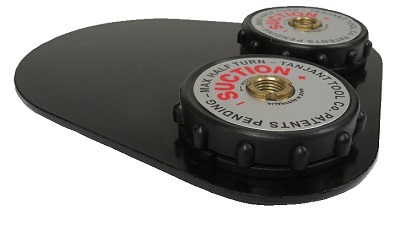 Use with Circle or Roller Guide. 1050mm (41″) when used with Circle Guide. Tanjant’s Plasma Roller Guide improves cutting operations from the first use. The sintered iron wheels spin freely on stainless steel axles and are fitted with a unique hub-guard to ensure free rolling, no jamming. The Glass Reinforced Nylon (GRN) Body is heat resistant and provides electrical insulation. Each Roller Guide is profiled to match a specific Plasma Torch. Use the Torch Look-Up feature on the Tanjant website to select Torch Brand and Model. The search result will display the correct Part No for the Roller suited to your torch. Wheels are height adjustable for tip clearance and kerf compensation angle. Running the tip above the plate prevents damage from dragging and is a much smoother and faster cut. Tip life is greatly increased as a direct result of using the Roller Guide. Supply of clean air at the correct pressure also has an effect on tip life. The Plasma Roller Guide may also be used with other Tanjant products including TJ6051 Radius Bar, TJ6086 Magnetic Pivot and TJ6505 Suction Pivot. Tanjant’s Plasma Circle Guide improves cutting operations from the first use. The profiled GRN Bushing is factory fitted and tested for smooth turning. Use either the straight or offset pin as the pivot point and start with the rail frame under the torch handle, pierce the plate and then rotate the frame to cut around the full circle. See more with How-to-Use feature on website. Each Circle Guide is profiled to match a specific Plasma Torch. Use the Torch Look-Up feature on the Tanjant website to select Torch Brand and Model. The search result will display the correct Part No for the Circle Guide suited to your torch. The Circle Guide is supplied with pivot pins and extension bar to enable circle cutting from 35mm (1-1/2″) to 700mm (28″) Actual dimensions may vary with some torch types. The Plasma Circle Guide may also be used with other Tanjant products including TJ6051 Radius Bar, TJ6086 Magnetic Pivot and TJ6505 Suction Pivot. Tanjant’s Plasma Guide Kit improves cutting operations from the first use, for almost any workshop cut requirement. The profiled GRN Bushing is factory fitted and tested for smooth turning. Use either the straight or offset pin as the pivot point and start with the rail frame under the torch handle, pierce the plate and then rotate the frame to cut around the full circle. See more with How-to-Use feature on website. Cuts maximum diameter of 1050mm (41″) with Circle Guide. Height adjustable. Use with Circle Guide and Roller Guide. Combines two practical accessories in one package. The locating marks on casing clearly shown in the picture on the left. Height adjustable by releasing left side thumb screw. Release the screw on the right (in picture) to slide bar along for adjusting radius. Use with Circle Guide or Radius & Roller Guide Grooves on cup at 90deg intervals to locate center. Use with TJ1081 Circle Guide and TJ5090 (H1) Trakka Holder. Precision achined brass, 10-24 thread & setscrew supplied. Select correct bush from Torch Look-Up List on the website. Use wiith Plasma Circle Guide or Trakka Holder TJ5091 (H2) or TJ5101 (H3). Laser marked with Part No. GRN material very strong & stable, insulates torch from current leakage. Refer to Spare Parts/Thread Information on website for detail. Tanjant’s Trakka Line Cutter improves cutting operations from the first use. The adjustable trolley frame and wheels run smoothly to give clean cut edges every time. Magnet Bases slide and twist-lock. Ease back and rail will slide along the bases for extra cut length or offset cutting on a bench stop. Each Bushing and Holder combination is profiled to match a specific Gas or Plasma Torch. Use the Torch Look-Up feature on the Trakka webpage to select Torch Brand and Model. The search result will display the correct Part No for the Trakka suited to your torch, including Holder & Bush. See more on website. Bevel cutting is so easy – Holder Arm swings out for angle and up or down for tip clearance. Also great for fine adjustment kerf-cut angle compensation. The Trakka Line Cutter can be tailored to suit most requirements by adding extra lengths and accessories. Originally designed to cut 1.2m (4′) plate out of rack storage, it offers the versatility to cover all workshop applications. Ideal for site-work and short cutting runs. Adjust frame tension to set smooth roll speed. Includes TJ5260 Joiners (2). Supplied with 2 Rails 800mm (32″) each for assembled length 1.6m (63″) Seamless join, exact fit.